Perhaps in some ways, the last thing that one would expect from the modern Rado brand is a heritage-inspired dive watch, but that’s exactly what 2017 has brought – a homage to one of their pieces with its origins in the 1960s, named after an explorer with special significance to Australia. A watch whose origin dates back to 1962 but whose production (in various iterations) covered a period until 1972, this divers’ watch had the classic looks of similar watches of that period, with its dark dial, black rotating bezel, large luminous markers and hands. The changes made to the Captain Cook over this period included case shape (to tonneau), the movement of course, the addition of an inner bezel. It is also worth noting that the original Captain Cooks found their place in both the men’s and women’s collections, something that has maintained in this, their newest iteration. Meet the 2017 Rado HyperChrome Captain Cook family of three new watches. The first one we will share is also the one that most closely resembles the original on which it is based, the Captain Cook Ref. 763.0500.3.130, although with just 100m of water resistance (the original was, I believe, some 220m). You can see it below on the right. Its case is in polished stainless steel and at 37.3mm (thickness of 11.1mm), it is slightly bigger than the original’s 35.5mm, but it is nice to see a modern ‘homage diver’ with restrained sizing. With a stainless steel diver’s bezel with a black ceramic insert displaying a 45 minute scale, it has sapphire crystal with anti-reflective coating on both sides. 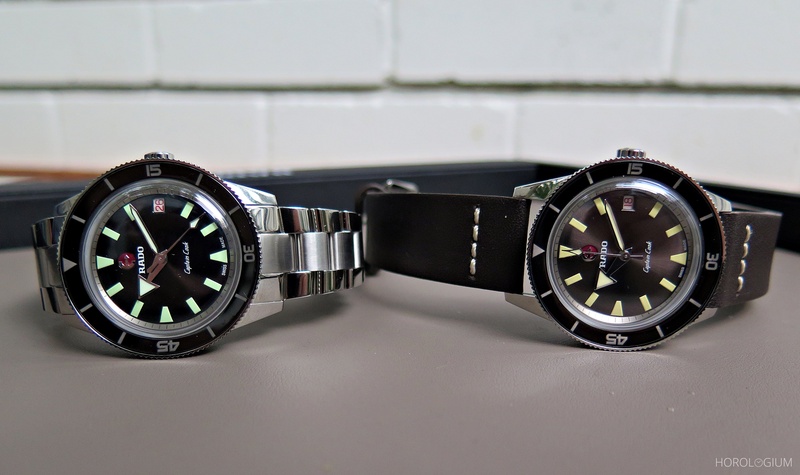 The dial is sun-brushed black with features that are pretty faithful to the 1962 version, from the size and shape of the faux-vintage coloured Super-LumiNova hour markers to the chunky arrow-shaped hands, the font of ‘Captain Cook’, and the rhodium-plated moving anchor symbol on a red background. The date window is perhaps the one thing that is most noticeably different, smaller and alongside a hour marker, which is more akin to the latter versions of the original. The screw down case back has a seahorse stamped on to it, as well as an engraving of the watch’s limitation number /1962, the number chosen to mark the original’s launch year. As is the fashion nowadays with many ‘modern vintage’ pieces, it comes on a dark brown strap of a popular ‘vintage look’ design. As you can see from the photo above, there are two 37 mm models, the other being a women-targeted piece that is probably not so much about diving (water resistance of 100m). This new iteration has a polished stainless steel case with a white ceramic bezel. Dial wise it is a silvery, slightly raised dial that has eight Top Wesselton diamonds beneath the same double anti-reflective sapphire crystal as the men’s version. However unlike the previous one, it comes on a Milanese bracelet. The final model in the collection is the HyperChrome Captain Cook Ref. 763.0501.3.220, which has a larger more ‘modern’ 45mm diametre case in Grade 5 Titanium. Under it domed crystal it has taken a colour divergence from black to a deep blue sun-brushed dial with a matching ceramic bezel and a blue textile strap (although you can also get a black strap). The water resistance is also ramped up for this version, to 200m. All of these new Captain Cook models are powered by the same automatic ETA C07.611 movement with 80 hours of power reserve. The black dial steel version is obviously the variant closest to the original, and thus for the homage purists, but the larger version does actually stand well on its own as a modern ‘update’. Perhaps having two sizes is having a foot in both camps, but this isn’t necessarily a bad thing, especially as they are all such different creatures, each with a markedly different ‘feel’ on the wrist. If you want to learn a bit more about the originals on which these are based, click on this link.